We’re not really sure what Apple was thinking when they decided to stretch albums artwork over the length of the iPad’s lockscreen. Stretching typical album art over the full length of a 9.7-inch Retina display is a great way to learn about pixels and compression artifacts first hand. Snow Cover Simple’s alternative is to move that pesky album artwork to a smaller box, making it appear sharper and clearer on a high-resolution display. Album art looks great in Snow Cover Simple, when set up properly. Snow Cover Simple threw me for a bit of a loop initially, because the Cydia page didn’t mention its dependency on WinterBoard, so I thought the tweak wasn’t working. 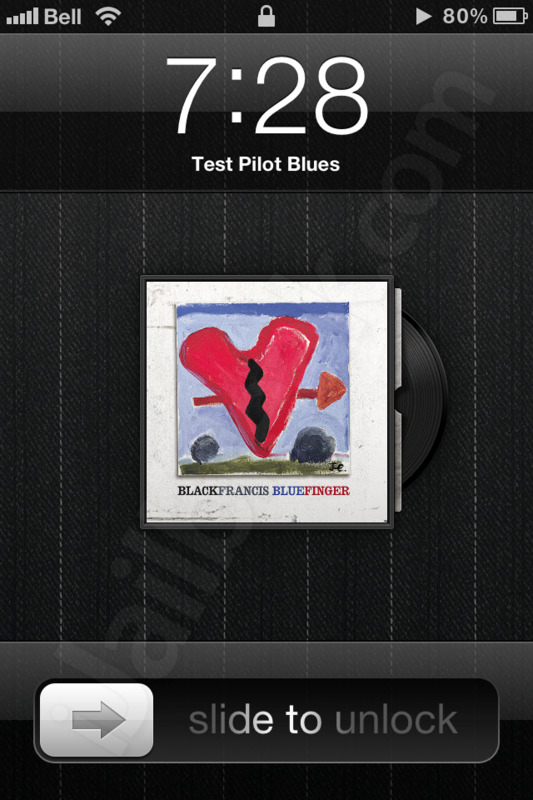 Without enabling the theme in WinterBoard, the ads would show up but the album art wouldn’t. To properly set up the tweak you have to enable the MazaMuzix Snowcover skin in Settings -> Winterboard -> Select themes. 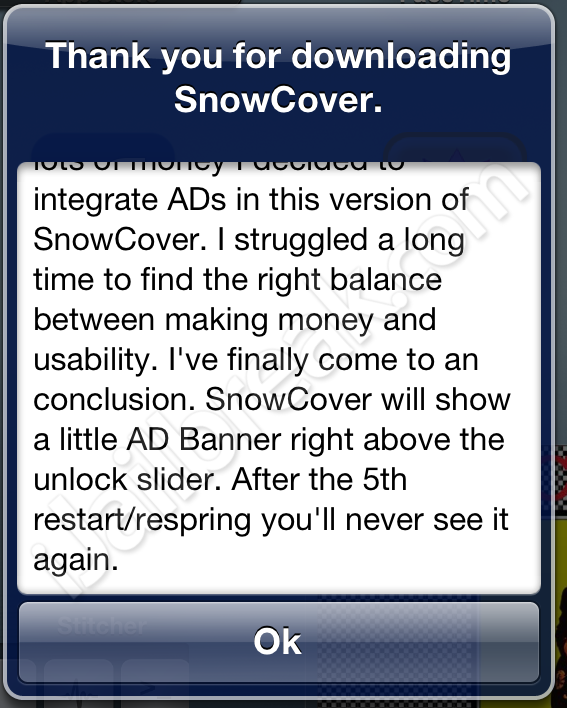 There are ads in Snow Cover Simple, included because the developer (Giulio Petek) is a student and looking for revenue, but these ads are designed to disappear after 5 resprings or resets. True to his word, the ads disappeared from my phone after 5 resprings. Since this is a visual tweak, the most important aspect of the tweak is how it looks. I’m happy to report that the shrunken down album art looks clear and sharp on my iPhone 4’s Retina display. One thing to note is it will stretch out non-square album covers, stretching them to square instead of cropping or letter boxing the image. This shouldn’t be a problem in most cases, as most album art is square, but could lead to a few covers looking slightly skewed. At the postage-stamp size it isn’t a huge deal. According to the Cydia page, Snow Cover Simple supports both the iPhone and the iPad, though I suspect this may be a typo for the iPod Touch. The tweak wasn’t compatible with my test iPad 3. On the big screen, the album art doesn’t match up with the MazaMusix skin properly; the tweak also erased the all-important ‘slide to unlock’ bar, trapping me at the lock screen. Hopefully the incompatibility with the iPad will be addressed in the near future, since the effects of low-resolution album art are more severe on the larger display. Official explanation of Snow Cover Simple’s ads. Snow Cover isn’t an unknown Cydia tweak: The original versions of SnowCover and SnowCover Pro were popular WinterBoard tweaks on iOS 4. Hopefully Snow Cover Simple can grow into a full iOS 5/6 replacement of the original. While Snow Cover Simple is a pared-down version of the original tweak, Simple includes some new assets of its own: Snow Cover Simple includes support for other music apps, such as Spotify. The tweak is available for download in the BigBoss repository. What do you think of Snow Cover Simple? Do you prefer your album art large and blurry or small and sharp? Share your thoughts in the comments section below.